Creating a beautiful landscape for your home or business goes beyond planning and implementation. Your foliage requires continuous maintenance in order to not only look good, but to flourish and remain healthy. 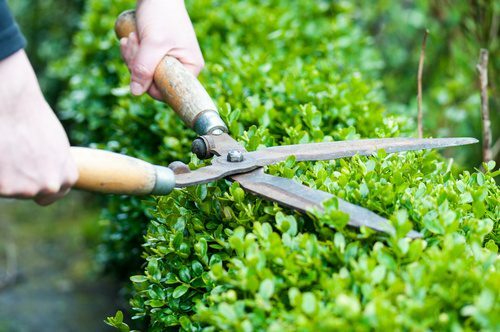 Kable Landscaping provides professional bush trimming service that takes the burden of knowing when to trim your shrubbery and how far to cut it back off of you and places it on us, the professionals. Bush trimming sounds like a pretty straight forward task, right? Just snip off a few branches and you’re done. Well, it’s not that straight forward. In fact, there’s a science to it, and if not done properly, your plant’s growth could be severely hindered for the next growth season – if not longer. You can rely on our experienced professionals to give you honest answers about your plant’s needs and to perform the least invasive bush trimming service possible that leaves your plants looking great and still able to grow and thrive for years to come. When pruning, it’s important to understand which branches and leaves need to be removed, as well as which ones should stay attached. During the first year of a bush’s initial growth period, it’s important to allow your new bushes to bloom to their full potential. During this period, it’s also important to make sure buds are cut so that branches can properly develop. Pruning shears and hedge clippers will naturally dull over time with extensive use. At Kable Landscaping, we keep all our tools and equipment properly maintained and sharpened so you don’t have to worry about the hassle. One call takes the hassle of bush trimming off your hands. Call Kable Landscaping today at (989) 695-5222 to talk to us about all of your landscape maintenance needs. We look forward to hearing from you!